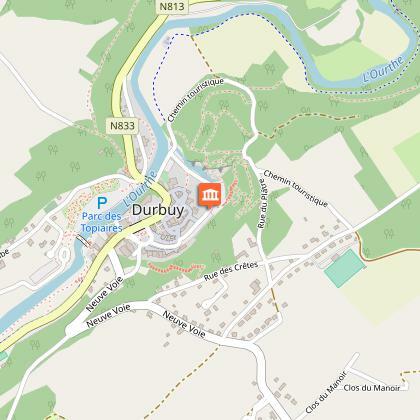 For more than 130 years, the Recollectine nuns led a faultless life in Durbuy. Anxious to help the residents, they opened a pharmacy and ran a school where local girls could be educated for a small fee. In order not to rely on others, they opened a boarding house for young girls of nobility and elderly ladies. We remain indebted to them for various major projects that they completed in return for the land that they received. In 1725, the branch of the river that encircled the town and passed this exact spot dried up. The little city gained space and salubrity. However, the town continued to suffer from uncontrollable floods which regularly made the headlines until the construction of a flood wall next to the anticline in 1995. The Sisters surrounded their property with a wall that remains partially preserved today. Twenty metres to the right, there is an ancient sealed-up gate dated 1725. The date indicates that this wall has nothing to do with the medieval surrounding wall which disappeared a little earlier. Also in 1725, the Recollectine nuns furnished the town with its first stone bridge behind the Recollet church. Of the small humpback bridge, only a crucifix with the date remains. It is still visible on the current bridge. Finally, it is worth noting that when approaching the anticline, you can see the 'ecaliers des béguines' or Beguine Steps which the intrepid Sisters carved out of the rock and which have led walkers to the top of the city for more than 200 years.